Have you seen bloggers that publish their income reports and noticed that a good chunk comes from affiliate marketing? Well, it’s time to take a closer look and depict those secrets and how to transform yourself in a successful affiliate marketer. Simply put affiliate marketing is the action of promoting other company’s products or services and earning a commission in exchange if you refer a client. Also known as vendor, retailer, advertiser or creator. This is practically the producer, the company that makes or creates the product/service. Could be a large, worldwide known company as Microsoft, who produces Windows. Or an entrepreneur like Ruth Soukup, who sells a highly appreciated blogging course. In fact, anyone having a product to sell can be a seller in an affiliate marketing, be it a startup, solopreneur or Fortune 500 classified company. Not all specialists consider the affiliate marketing network as an element within the affiliate marketing system, but since in many cases it is the middleman between the seller and the affiliate, it is worth mentioned. You can of course, arrange a direct affiliate revenue share with someone that creates an online product. But most often including a reputable network like ClickBank, ShareaSale or CJ Affiliate to deal with products delivery and payments, will offer you credibility. Automates some processes like payments. Besides sourcing products, handling payments and delivery, the affiliate network handles the tracking cookie that will be placed into the client’s browser after clicking the affiliate link. The affiliate/publisher is the person or company that makes the promotion, the ad in an affiliate system. The publisher can be anybody you, the lady next door, the neighboring bookstore or a large company like Etsy. The affiliate usually uses his site to promote the products/services for which he is affiliated, or these days is also possible without a site via social media for example. The affiliate site presents the affiliated products via blogs, articles or product presentations and includes a special link, called the affiliate link, that links to the product on the seller’s site. This is the value of the affiliate, he attracts and convince visitors to buy a product/service. Affiliate marketing can generate in commissions anywhere from a couple hundred dollars to millions of dollars monthly. The client is the central point of the affiliate marketing program. If the client does not react, the system does not exist, no affiliate commission, no income to share. The affiliate cookie is responsible for the registration of the sale through your unique affiliate ID and consequently for earning the corresponding commission. The cookie is the information that is sent when a client clicks your affiliate link. 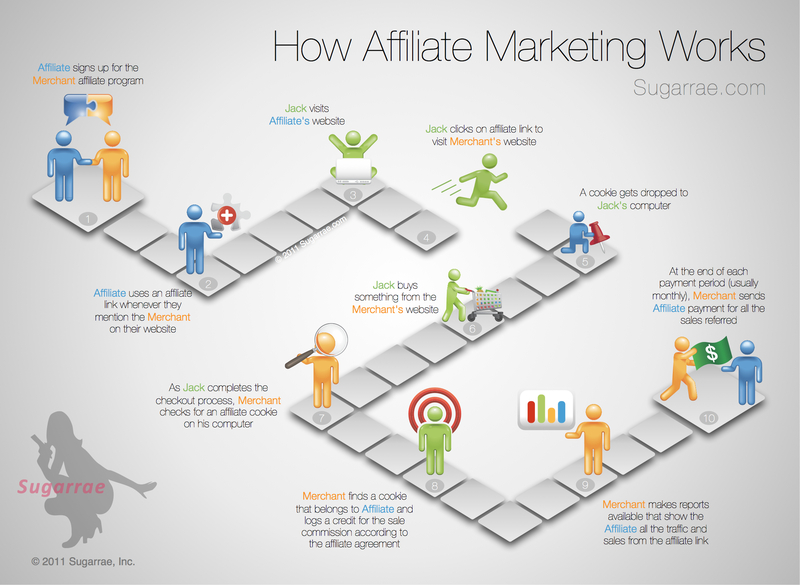 The lifetime of an affiliate cookie varies from a couple of hours, to days, weeks or even lifetime. The duration of a cookie depends on the affiliate marketing program and product. Do yourself a favor and verify this detail, when adhering to an affiliate program. The affiliate cookie disappears in two situations: when it expires and when the cookies are cleaned from the browser. * You decide which products you promote and where. The promotional materials will be provided to you. * You have the advantage of selling products that you do not have to manufacture, store or transport and more over, products that proved their value on the market. * It’s the most reliable and the fastest manner to generate income when you are just starting with your business. * You can work from wherever you want, when you want and how much you want, as long as you obtain the desired results. * Sky is the limit in terms of potential income. And can easily be transformed in a passive income source. * You can choose to affiliate with complementary products/services to those that you create. * You have the possibility to track your affiliate activity, what you sell, where, when and make the necessary adjustments. * You don’t have any type of control on the affiliate marketing program or affiliate network that may change policy, renounce at the product you are promoting, make technical changes on their platforms or totally cancel the affiliate program. * Payout schedule and conditions are also out of your control. * There is the risk of not getting paid, small in general, but exists. * For popular products you will have to face a tough competition. And the 1Million Dollar Question… How Much Can you Earn via Affiliate Marketing? Each network and the commission it pays is different, depends which fits best your goals. For affiliate marketing beginners sometimes, it might take up to one year to see their first sale, but it also may happen from the first month. Depending on products the commission varies most often between $5 and $100 for each sale and may be hundreds or thousands in the case of more sophisticated products, like online courses or software subscriptions. · Percentage of the price: you receive a previously established percentage of the product’s price. In general, for physical products the commissions vary between 4% and 8%, for digital products percentages are between 30% and 50%. · Commission per lead: you receive a fixed amount when you refer a customer as a new lead. These are small amount commissions, up to several dollars, when a visitor uses your affiliate link and signs up for an account with a company but doesn’t buy anything. · A fixed sum: you receive an established fixed amount independent of the product price. Most often this is a decent sum. For instance: Bluehost offers a commission in sum of $65 for any of its plans. Take into consideration that affiliate marketing is not a get rich overnight scheme, you need sustained efforts, knowledge and perseverance to see good results and maybe years to see your goals become reality. Now, having the mechanism and basic terms defined, let’s pass to the next stage. I always say when starting something, start with a strategy. Maybe it’s just me, but I need to ensure that the path I follow leads me to where I want to arrive or to the level I want to reach. Before starting you may want to read everything you can find on the subject and how others succeeded to make money from affiliate marketing. It’s up to you if you are prepared to pass through a trial and error process on your own till you obtain results or if you want to take some courses to shorten and speed up the process. Or if it fits your scope, if you plan to build a business exclusively based on affiliate marketing try Wealthyaffiliate. Before deciding what products and what affiliate networks you will use, you need to take into consideration your audience and her struggles and choose an affiliate marketing program that resonates with your audience, that your audience wants and is interested in buying. Promote just products that are useful for your audience. And even more important promote products/services your used or use and you are comfortable being associated with. These will ease your task, strengthen your affiliate sales and create a loyal audience that will trust you. When starting, opt for a smaller number of products, some experts say no more than three, others consider optimum up to ten. Depending on your niche try to focus on three affiliates first, after that add more. Start small, know very well the products you promote, test strategies and promotion channels, update and adjust till you obtain the results you want and after that move on and add new products. You can focus either on affiliate networks, either on individual affiliates, or a combination of both. Affiliate networks are the intermediaries between affiliates and the producing companies. One of their advantage is that they host tens, hundreds or thousands of affiliate programs and they have an infrastructure that offers more predictability concerning payments. Usually they have established rules like: payment for February earnings is made next month on the 10th. You should check each affiliate network and verify the programs and the conditions it offers. What’s your target? You promote for example cooking stuff or fashion items or tools for bloggers. Choose the network accordingly, not all networks propose items in all niches. Costs of using the network. How much are you charged for using their platform? Which are the features that the network provides? Do you need to track some vital information like new customers or returning customers? Make sure that the platform provides the features you need. Worldwide known and hosting every product imaginable under same roof. Amazon Associates has a solid reputation and it is used across the globe and is very easy to use. The commission offered ranges between 4% and 10% and you receive a commission no matter what products the visitor that clicked on your affiliate link bought. That means you may recommend a product, but on Amazon your visitor buys something else not what you recommended and you still receive your commission. Be aware that you will be paid only for the sales made by people in your country and payments are made once the threshold of $100 is reached. Also, you need a good amount of traffic to see reasonable revenues from Amazon. And another minus is that everyone under the sun is Amazon affiliated and the competition is tough. One of the top affiliate marketing networks in the world, with more than 3900 merchants and a great reputation. If you refer them, you earn $150 and after you are accepted you can pick other programs to represent as affiliate. ShareASale has a nice collection of companies using its services like Optin Monster, Grammarly, Sears, BornToSell, Zazzle and covers an impressive number of products and services. They make payments monthly for thresholds over $50, send money in many countries and you can be paid via check or direct deposit. Another super easy to use affiliate network is Shopify, an e-commerce platform that sells myriads of products online. Their approval process is quite speedy, and you may earn up to $2,000 on a sale. Well, that’s quite a bunch of money!! Rakuten, former LinkShare, one of the veteran affiliate networks, is constantly evolving bringing new business ideas and ways of promoting. It covers almost all countries and has educative programs to help you succeed in affiliate marketing. Rakuten puts at your disposal various methods of payment and executes payments for thresholds of over $50. Priding with having over 12,000 advertisers (uhh, that’s impressive!) to choose from Flexoffers is worth paying some attention when choosing an affiliate network. Their main focus is to gather high-end merchants and to offer interesting products for their affiliates. Their offer comprises many companies, from countries across the globe. Your other option is to join independent affiliate programs. The first step is to check on the site from which you bought the product that you want to recommend. If they don’t have an affiliate program you can reach to them and ask if you can become partner. To identify affiliate programs to promote, you always have the option of “asking” Google or check on your favorites influencers, bloggers to see what they recommend, try those products and see if they are a match for your audience too. Some much-preferred affiliate programs are: Grammarly, Bluehost, ConvertKit, etc. Also, if you have or plan to have your own products, you will consider creating your own affiliate program to promote them. Create valuable resources for your buyer personas like tutorials, reviews, roundups, where you provide lots of details and useful information to help and educate your visitors. This is one of the most efficient ways to promote your affiliate links without looking salesy. Tutorials are posts that show you step-by-step how to execute something and most often they provide high value for the reader. For instance, this tutorial from Smart Business Trends on Google ad-sense is a relevant example. Writing products reviews is another great way to promote affiliate links. You share with your audience your experience, what you liked, what you didn’t, why do you recommend a product or not. The primary ingredient for writing reviews is genuine honesty. Your readers are interested in knowing your own opinion about a product they consider buying. Social media is the magic word and one of the most efficient ways to promote affiliate links. Useless to say vis social networks you reach by far much more people than through your site, in most cases. Pinterest is the first platform recommended for affiliate links. And more over you can fully automate your promotion schedule on Pinterest. To use social media at its full potential, try different strategies and different networks, share in Facebook groups, pin on Pinterest, share on Twitter or try Instagram posts with call to action. Pay attention and respect the rules for each platform and avoid being spammy. Since your most valuable asset is your mailing list, it comes naturally that your email list is your most profitable string for affiliate marketing profit. Usually you promote your affiliate products by sending mails to your subscribers with your affiliate links and relevant information about those products. Try to find a balance between your promoting mails and free useful content. Do not spam your list with offers, be it your own products or affiliates. This is a serious reason to lose your audience. I just unsubscribed to Michael Hyatt’s list for this reason, I receive each other day an email promoting various things and even there are days when I receive 5 mails. When it is too much, it is too much. Even if the sender is an admired giant. You can create a resources page to share with your readers what tools, products are you using in your business. Or you can create a post with your tools collection. For instance, a business blogger will list favorite applications and tools, courses, books, influencers, mentors, etc. Then make a pin for the page and promote it on Pinterest. One of the first things you need to do after adhering to affiliate programs is to insert affiliate links in all your blogs, where appropriate of course. Update and tweak your old posts to accommodate your affiliate links. Affiliate marketing is an excellent way to diversify your income and make some supplementary income from your blog. Be patient and willing to learn how affiliate marketing works and sooner or later your efforts will pay off. Let’s hope it will be sooner!